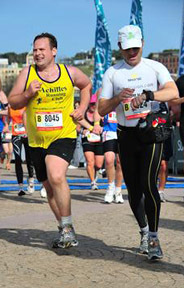 Ben and I during the Sydney Marathon in 2010. Born legally blind, Ben’s limited sight did not stop him from playing rugby league when at school. As an 11-year-old, he was introduced to blind cricket. He has been able to overcome his adversity by playing cricket for Australia and also saved a young boy’s life when that boy was being attacked, and has gone on to complete a diploma in childcare. In 2013, Ben and I fulfilled our big dream – to run the iconic New York Marathon which he mastered in a new PB for Ben in 4 hours and 38 minutes. 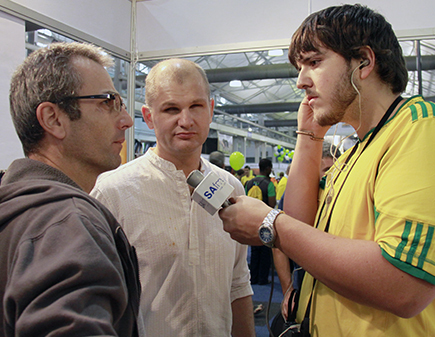 With Francois during an interview with the South African media before our Comrades. Francois was the first blind man to complete the South African Ironman competition in April 2008. He also completed the WA Australian Ironman competition at the end of the same year. Francois, who is blind since birth, completed the Ironman with fellow partner Jurie Krige in just under 14 hours! My friends Francois and Ben had dreams of running marathons, and they needed some help to fulfill them. So I started to train with the Achilles Running Club in Sydney, and I learned how to guide visually impaired people. If you are interested to get involved, please check out their website and get in contact. You can also find Achilles Club members every Sunday morning, rain, hail or shine, on the steps of the Art Gallery of NSW opposite the Domain at 8.10am.